The Yak-23 is a rank V Russian jet fighter with a battle rating of 7.7 (AB/SB) and 8.0 (RB). It was introduced in Update 1.75 "La Résistance". The Yak-23 is a Soviet single-engined jet fighter initially designed to intercept high altitude, long range bombers such as the B-29. As such, it has an extremely light airframe and relatively powerful jet which gives it an enormous thrust-to-weight ratio, making it one of the best climbing/accelerating jets in War Thunder. Conversely however, the Yak-23 is not only a good bomber hunter but also an excellent fighter. 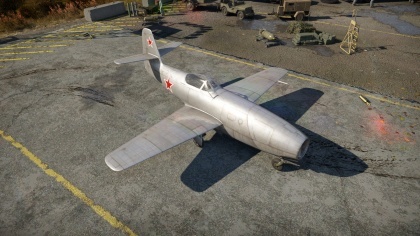 No jet can accelerate with the Yak-23 below 800 kph and no jet in the Yak-23's BR bracket can climb with it unless it has a massive energy advantage; thus, the Yak-23 has full reign over the vast majority of opponents it meets. The Yak-23 cannot carry any ordinance and is thus subjugated to purely fighter duties. However, it is by far the strongest fighter/bomber interceptor at its BR, and should be used accordingly. 1 000 350 520 ~?? ~? < 450 < 420 < 500 > ??? 57 mm Bulletproof glass in cockpit front. Light airframe + powerful engine = Yak-23. The Yak-23 is similar to a jet Yak-3 in that it has a ridiculous >.5 thrust-to-weight ratio. On that note, always take minimum fuel (9 min). Fuel forms a significant part of the Yak-23's mass and high fuel loads and fuel loads greater than min. fuel will severely dampen the Yak-23's performance. Ammo is limited enough as it is so extra fuel should not be necessary anyway. 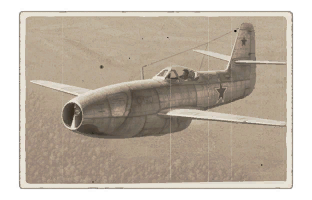 One should fight purely in the vertical and utilize the Yak-23's excellent maneuverability to take careful shots and stay out of the line of enemy guns. Energy-conserving chandelles and stalls are by far the most effective tactics to utilize as they best use the Yak-23's insane acceleration and climb rate. The G.91 is by far the greatest threat to the Yak-23, as it is a small target, faster, and has high-velocity quick-firing Browning M3 machine guns that will make quick work of the Yak-23. That, combined with its excellent roll rate makes it exceedingly difficult to hit with the low-velocity 23 mm mounted on the Yak-23.